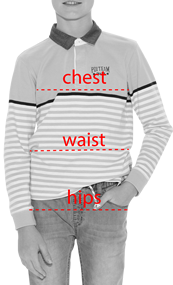 The guide below will help you find the best fitting size for your child. Chest : Measure from the under the armpits where the child is widest. He/she must stand with arms relaxed on the sides. Height : Place your child against a wall with legs together and measure from top of the head all the way down to floor.